Having problems with your air flow? Free and consistent air flow is crucial to the efficiency and performance of your HVAC system. Your HVAC air flow can be compromised for any number of reasons, so it is important to address the issue as quickly as possible to find the right fix. How do I know if I have an HVAC air flow problem? There are several indicators that can make you aware that you are not getting sufficient air flow from your HVAC system. If you are noticing hot and cold pockets of air throughout your home, it could be due to an issue air flow. If one room is hot and the next room is cold, that is typically one of the first signs of disrupted air flow in your HVAC unit. If this has been happening in your home, don’t worry it’s probably not haunted. More likely it is an imbalance of air pressure in your HVAC system. If you can barely feel any air coming out of a vent that is right in front of you, there is probably a blockage in air flow. What causes an HVAC air flow problem? A blockage in air flow in your HVAC unit can be caused by a variety of factors. The air filter is there to prevent dust and dirt from getting into the HVAC unit and the ducts that supply air to your home. Filters can become clogged with debris and therefore ineffective over time. Air filters should be changed regularly, the frequency of changes increases if there pets in the home or one of the residents has allergies. You may think you are saving energy by closing a vent in a room you are not in. This does not actually save energy, it just disrupts the balance of air flow from the HVAC unit. The same effect occurs by blocking a vent with furniture. Keep vents open and unobstructed for optimal air movement. The condenser unit is the component of your HVAC air conditioner that you will typically see outside. Leaves and dirt can get stuck in the unit, compromising air flow. Another common cause of air flow inconsistency is blockages or leaks in the ductwork. Regular HVAC duct cleaning and maintenance can negate this issue. If your HVAC unit is not properly sized for your space, it can result in inconsistent operation which can disrupt air flow. Interrupted air flow can also be caused by thermostat issues, like faulty wiring or improper settings. If the fan motor is working too hard to try to blow air throughout your space, it may be time for a replacement. 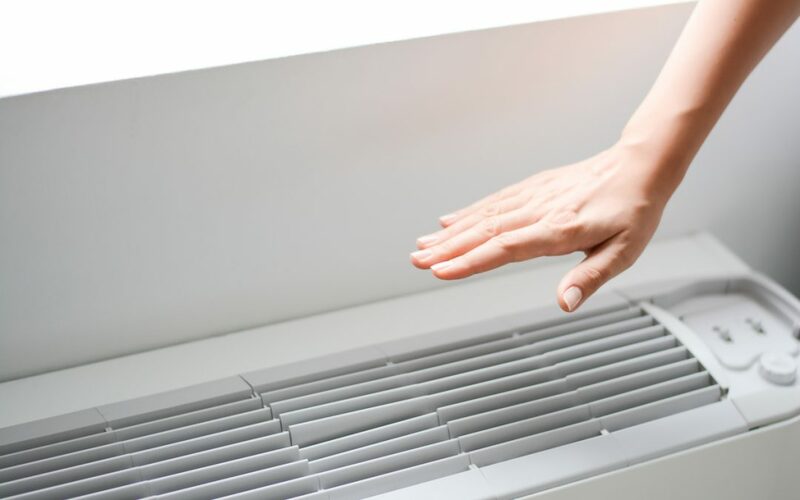 Condenser coils are responsible for releasing heat to blow cool air through the ducts. If the coils are dirty, the HVAC unit will have to work harder to dispense air flow. To ensure you are getting optimal air flow from your HVAC unit, it is highly recommended to have it serviced and maintained by a professional HVAC company. Air In Motion can assist with all your HVAC heating and cooling needs.